If the primary storage array is associated with a secondary storage array, you can use the secondary storage array as a data source for backup. 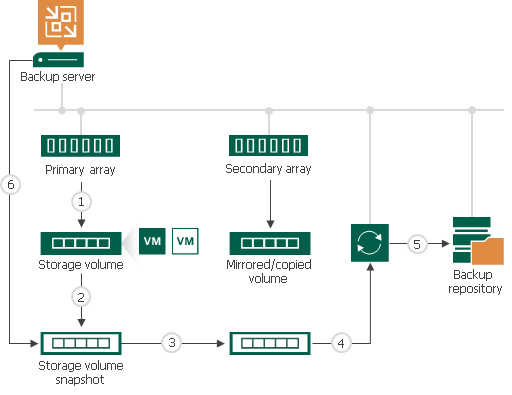 Backup from snapshots on secondary storage arrays reduces impact on the production storage. During backup, operations on VM data reading are performed on the side of the secondary storage array, and the primary storage array is not affected. To back up from snapshots on secondary storage arrays, you must configure the backup job to build a snapshot chain on the secondary storage array and instruct Veeam Backup & Replication to use the created snapshots as a data source. Backup from snapshots on secondary storage arrays is similar to Backup from Storage Snapshots on the primary storage array. Veeam Backup & Replication triggers a VMware vSphere snapshot for a VM whose disks are hosted on the primary storage array. Veeam Backup & Replication instructs the storage system to create an application-consistent storage snapshot on the primary storage array. The created snapshots capture the VMware vSphere snapshot. The VMware vSphere snapshot on the primary storage array is then deleted. The storage snapshot is transported from the primary storage array to the secondary storage array. Veeam Backup & Replication checks if there is a backup proxy that has a direct connection to the secondary storage array. The transported storage snapshot is mounted to this backup proxy. The backup job retrieves VM data from the mounted storage snapshot. When the job finishes processing the VM, Veeam Backup & Replication instructs the storage system to delete a snapshot on the primary storage array. The transported snapshot on the secondary storage remains in the snapshot chain until it is removed by the retention policy. [For HPE Nimble] On HPE Nimble storage systems, snapshot transport is triggered as soon as you create a new storage snapshot. For this reason, launch of snapshot transport and deletion of VMware vSphere snapshots are performed in parallel. 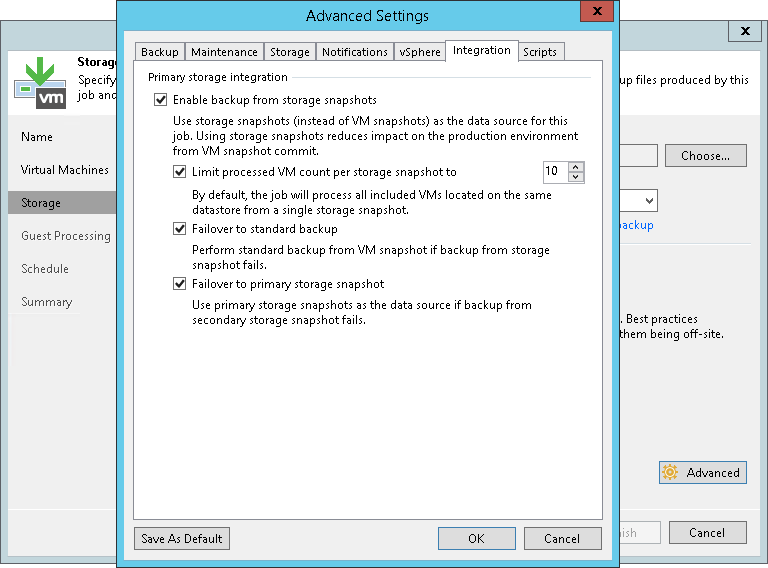 [For NetApp] Veeam Backup & Replication creates auxiliary snapshots on the primary storage system. The number of storage snapshots in the snapshot chain cannot be fewer than 1. In some cases, Veeam Backup & Replication may fail to back up VM data from storage snapshots on the secondary storage array. 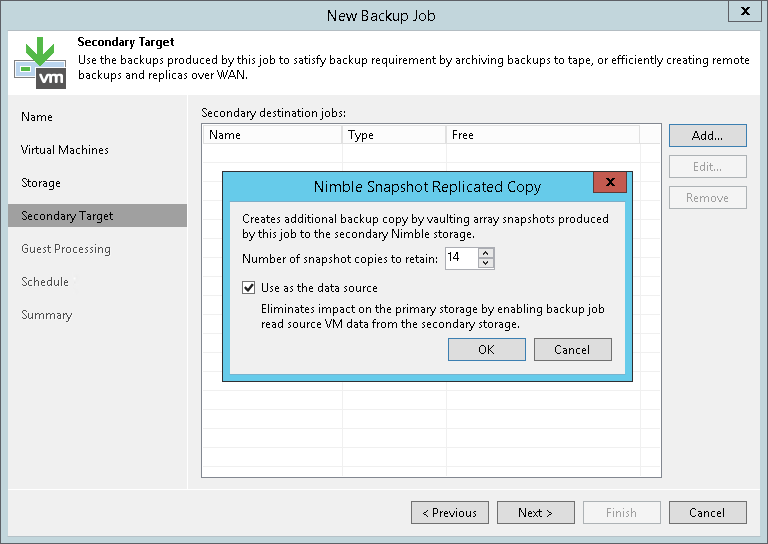 This can happen, for example, if Veeam Backup & Replication fails to connect to the secondary storage array or a license required for volume or LUN export is not installed (in case of NetApp SnapMirror or SnapVault). To overcome this situation, you can instruct the backup job to fail over to the Backup from Storage Snapshots on the primary storage array. In this case, Veeam Backup & Replication will create a storage snapshot on the primary storage array and attempt to transport it to the secondary storage array. If the transport process fails, Veeam Backup & Replication will retrieve VM data from the created snapshot on the primary storage array. To let Veeam Backup & Replication fail over to Backup from Storage Snapshots on the primary storage array, you must enable the Failover to primary storage snapshot option in the backup job settings. Failover to Backup from Storage Snapshots on the primary storage array is not supported for HPE 3PAR Peer Persistence and IBM Spectrum Virtualize with HyperSwap function.